The events followed the repossession of a property in December. A SIXTH PERSON has been arrested by gardaí in relation to a number of incidents which took place on a farm in Strokestown, Co Roscommon, in mid-December. The man, who is in his 50s, was arrested earlier today and detained at Castlerea Garda Station under Section 30 of the Offences Against the State Act 1939. Five other men have been arrested and questioned in relation to the attack at a property in Falsk on 16 December 2018. The events followed the repossession of the property by private security personnel days earlier. There were scuffles with the family who lived in the house and among a group of people who were present to support them. 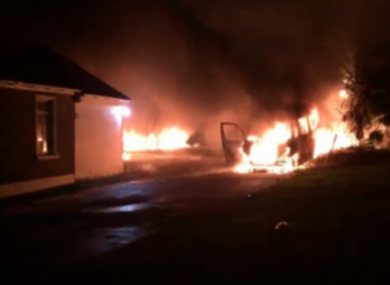 During a subsequent incident at the property, eight people were injured, three of whom required hospital treatment, while vehicles were set on fire and a dog that was also seriously injured had to be put down. The eviction led to a number of protests and the issue was raised in the Dáil. Gardaí said investigations into the incident are ongoing. Comments have been closed as a number of individuals have been charged in relation to the case. Email “Sixth person arrested in relation to Strokestown eviction incident”. Feedback on “Sixth person arrested in relation to Strokestown eviction incident”.